A 16 inch diameter cast bronze horizontal dial with 7 inch high cast and machined bronze gnomon. Dial face shows hour, half-hour and quarter-hour lines and Roman hour numerals 5 AM to 7 PM. The hour lines are corrected for longitude but no EOT correction is shown. 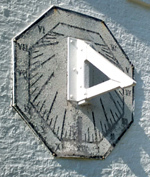 This octagonal vertical sundial is mounted on the due south facing wall of Shattuck Observatory. The dial is painted on wood. The hours are VI to VI (6 am to 6 pm) with lines for half and quarter hours. The thick triangular gnomon is rigidly mounted on the dial face. The dial is in excellent mechanical condition but the paint is flaking badly due to sun and weather exposure. Simple armillary dial about 2 feet in diameter sits on a triangular cut stone pedestal. The equatorial band has raised Arabic numbers at each hour. The hours are adjusted by 42 minutes to correct for zone time. The gnomon is an arrow rod of traditional fashion. The base supporting the armillary is a small hemisphere globe, with a map of the continents plainly visible. The armillary cuts the globe at the Greenwich hour line facing due north. The triangular granite stone pedestal was once part of the Captain John Smith Monument, commemorating him as the discoverer of the Isles of Shoals in 1610. Octagonal, approx 6 in. on a side Brass/Bronze Center compass rose, 4AM-8PM in Roman numerals. Standard stone pedestal. Probably not the original, as it is oversize for the dial plate.